You can rip DVD with VLC media player. But if you're so unlucky to come across VLC Won't Rip DVD problem, find causes and the easiest way out. If anyone can offer any help that will be great! 2. I'm following theis instructions from How-To Geek: http://www.howtogeek.com/howto/2696/how-to-rip-dvds-with-vlc/, and anytime I click "start", it just shuts out and looks like how it does when you first open VLC, no special recording or streaming message or moving anything. How to Fast Fix VLC Won't Rip DVD Problem? Get WinX DVD Ripper Platinum/for Mac - No. 1 fast DVD ripping software for both Windows and Mac OS X, that allows you remove any DVD encryption technologies, like DVD CSS, DVD Region Code Enhanced, Sony ArccOS, UOPs, APS and even Disney X-project DRM, and convert DVD to nearly all mainstream video/audio formats and potable devices, be it MP4, AVI, M4V, FLV, or iPhone, iPad, Andorid, PSP, Xbox, Chromecast, while delivering 3x-5x ripping speed than any other DVD rippers in the market. Just get it to say bye-bye to VLC Won't Rip DVD matter NOW! 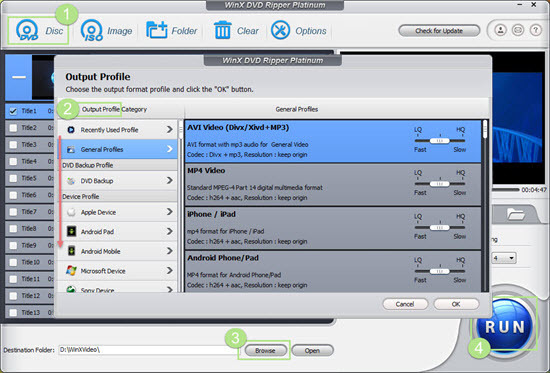 Step 3: Do DVD ripping settings, like choosing profile (MP4, WebM, TS, OGG, H.264, MPEG, HD, Android, Audio etc. ), destination folder and deinterlace. Step 4: All things done, click "start" to beging the VLC ripping DVD to video/audio. • Take the DVD disc out of the DVD-ROM drive and put it in again, or alter a DVD disc to have a try. • Restart your Windows PC or Mac OS X. • Reset VLC to default settings, or unistall and reinstall the VLC player, better the latest version (currently V.2.2.0). If those troubleshooting steps all fail to work, it means you should find other ways to fix VLC Won't Rip DVD problems, be it a certain one or a pile of DVDs. That VLC Won't Rip DVD problem cannot be settled via above methods means it's a must-do to find an alternative way to rip DVDs, especially rip what VLC cannot rip. Fortunately, No.1 DVD ripper - WinX DVD Ripper Platinum fits the bill, with which you will be no longer worry about "VCL rip DVD doesn't work sometimes" or "VLC rip DVD with so slow speed" any more. And this program provides much more media formats/device profiles than VLC, and can also edit DVD video, add subtitle, take snapshot as VLC does. How to Copy (Protected) DVD on Your Windows PC/Mac OS X with No.1 DVD Ripper? WinX DVD Ripper Platinum can remove copy protection from DVD, easily getting rid of DVD CSS, region code, RCE, Sony ArccOS, UOPs and even Disney X-project DRM at the ripping process. It is being continuously updated to rip any newly released movie DVDs, like The Gunman, Chappie, Kingsman: The Secret Service, McFarland, USA, Jupiter Ascending, Taken 3 and The Hobbit 3. Here we take ripping/copying Disney film Frozen on Windows 10 for example to show you how to rip a copy protected DVD with it. Put DVD to DVD-ROM drive, run WinX DVD Riper Platinum, and click "DVD Disc" button on the top left to upload DVD content in just a few seconds. The 320+ different output formats and 350+ device profiles cover nearly all mainstream ones, e.g MP4, AVI, WMV, MOV, FLV, iPhone, iPad, Android, Xbox, PSP, Chromecast, MP3, WAV, HD video. Also, "DVD Backup" profile is recommended for lossless DVD ripping, like "Main Title Copy" and "Full Title Copy". 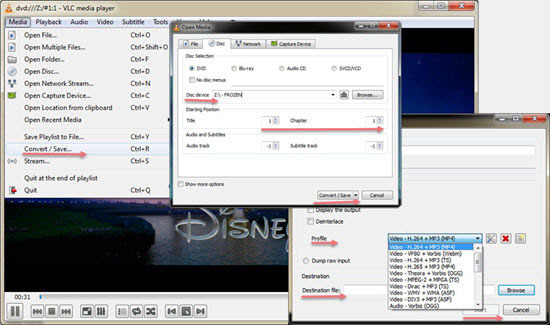 As to the right movie title, WinX DVD Ripper can analyze and check it automatically. Here Title 1 is the right title of Frozen DVD. Choose "Safe Mode" to prevent the process from crashing/stopping at 99%/very end. Tap the blue "RUN" button to begin ripping Frozen DVD at No.1 fast speed, 3-5x faster than general DVD rippers in the market, let alone VLC media player. • Make personal settings, choose subtitles, etc. * The free trial version can just rip DVD content in 5 minutes at most. So if this program is palatable to you, just buy it right away! * The software developer only advocates ripping/copying DVDs for personal use only and suggests referring to the DVD copyright laws in your countries before doing so. VLC Setup Guide: How to Set up VLC for Media Streaming etc.